This week I travelled with friend and fellow natural history photographer, Peter Willmott, to the wilds of the Thames Estuary and the Essex Wildlife Trust’s nature reserve Two Tree Island. The two majestic elm trees for which the reserve was named were lost to the joint effects of Dutch elm disease and harsh gales and these days the area is covered with a variety of bushes few of which could be described as trees. The main attraction is the vast expanse of ever changing estuary with its food-rich mud full of shellfish and marine worms, crabs and a rare and precious estuary plant called zostera or sea grass – food for the huge flocks of Brent geese that winter here building up their strength for the long journey north to the Arctic Tundra where they will breed and raise a new generation of their kind. As the tide ebbs and flows under the gravitational influence of moon and sun thousands of hectares of glistening chocolate-coloured mud opens up to wildlife like a well-stocked supermarket. In winter the island is home to a variety of wildlife and the mud echoes with the fluting calls of curlew and chirruping tiny waders that run about like clockwork toys picking up tiny scraps of food. Redshank and oyster catchers set up frantic alarm calls seemingly for no other reason than they like to hear the sound of their own voices. However, Two Tree Island is not just for winter or for wetland birds; the bushes and clumps of blackberry brambles hold myriad songbirds, some of them spring migrants and others that are local residents. Peter and I were watching the birds from the hide overlooking the lagoon and the antics of pairing avocets sweeping their elegant sail-maker’s needle-like beaks through the water’s surface in unison. 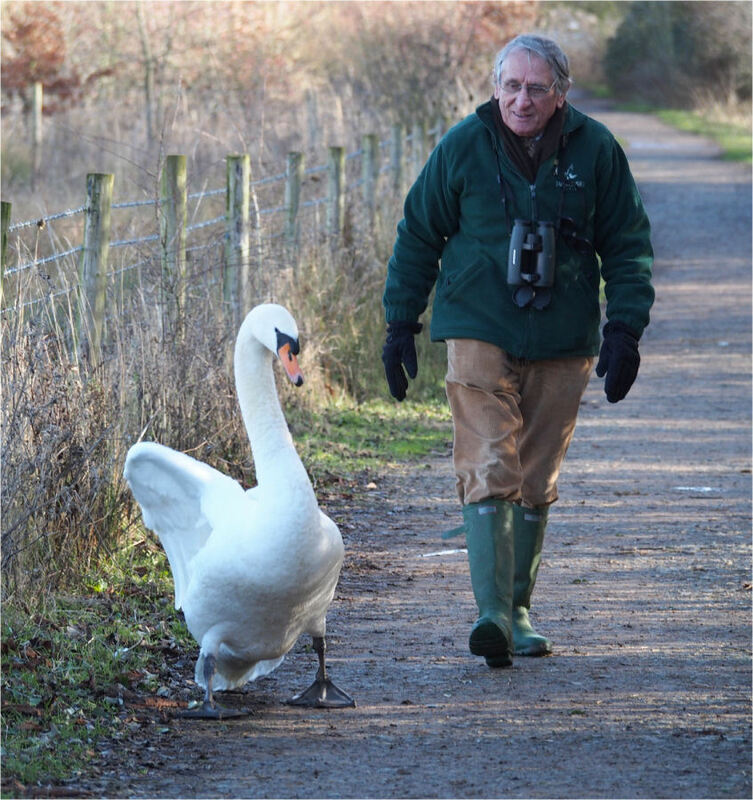 Looking out of a bird hide with modern optics highlights distant events while other, equally important things are going on just in front of you – under your nose. 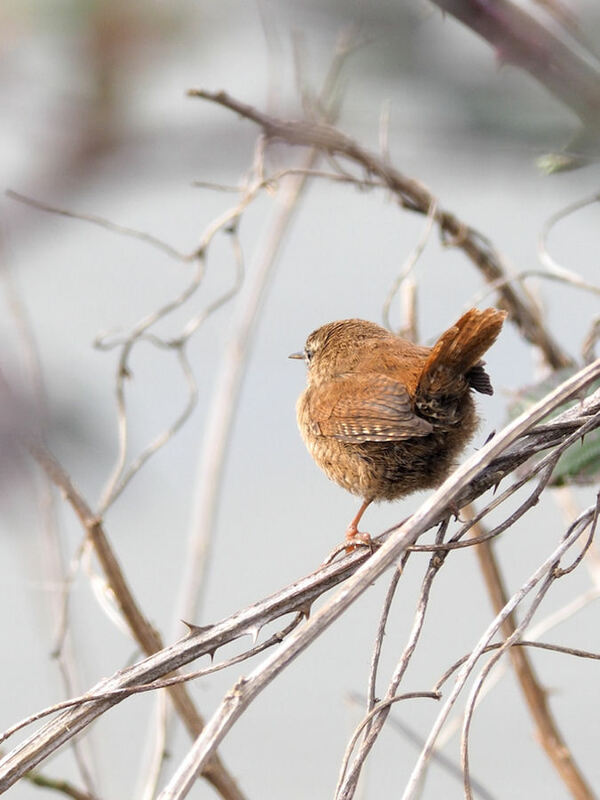 Such a one occurred when a wren, full of the joys of spring and keen on defending its territory, appeared from the bushes in front of the hide, little more than a meter and a half away. Peter had his camera at the ready, but by the time I had focussed mine, the wren, fed up with waiting for me, flew off. Peter’s picture, however, is a classic. In a week or so the Brent geese will be up and away to their northern breeding grounds, but for the moment, they are still flying in large flocks as the tide turns, filling the air with their barking, chuckling contact calls.